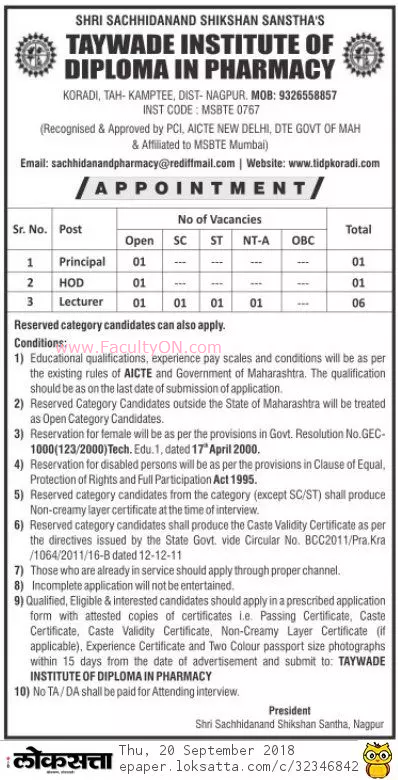 Taywade Institute of Diploma in Pharmacy, Nagpur has advertised in the LOKSATTA newspaper for recruitment of Teaching Faculty- Lecturers / HOD / Principal jobs vacancies. Interested and eligible job aspirants are requested to apply within 15 days from 20th September 2018. Check out further more details below. About College: The college has successfully completed 10 years of its service to the cause of education particularly in rural area. It has got sufficient infrastrucutral facilities such as very specious building with well equipped laboratories and library, qualified staff and extensive play ground with proper facilities for all the games and sports recommended by Physical Education Dept. of Nagpur University. How to Apply: Interested and eligible candidates are requested to send applications in prescribed format along with attested copies of certificates (Passing Certificate /Caste Certificate / Caste Validity Certificate / Non-Creamy Layer Certificate (if applicable) / experience certificate) and 02 colour PP size photos to the postal address given below.